​Four arrests have been made following the violence which took place outside Vicarage Road and left two men needing hospital treatment, following Watford's Premier League clash against Everton on Saturday. According to the Hertfordshire Constabulary, the injured men suffered facial cuts and bruises in the incident. Police were called to the scene at around 5pm, shortly after the conclusion of the match. 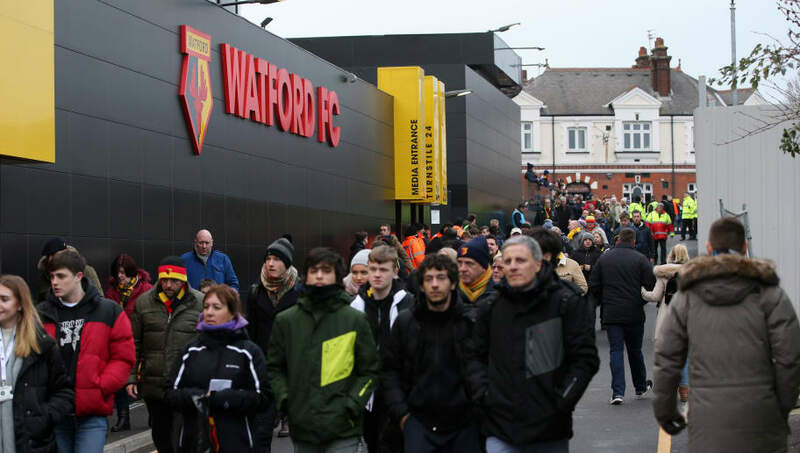 As reported by ​Sky Sports, one ​Watford fan, 31, claimed to have "heard a lot of shouting" before he "went to take a look" as he was leaving the stadium after the match. The supporter claimed to have seen "a Watford fan lying on the floor, apparently unconscious, with blood on his face." He added that there were "three ​Everton fans running from the scene towards the town centre," and that "friends around him were crying and shouting for people to help and call an ambulance." Images on social media have also emerged depicting people gathered around an individual seen lying on the floor, with a member of the crowd referring to someone as a "coward." A spokesperson said of the incident: "At around 5.10pm, an altercation occurred between a group of men. Saturday's events follow last month's incident of violence in which Everton fans were caught up in similar altercations with Millwall supporters following the FA Cup tie between the two sides at the Den. Watford were victorious over former boss Marco Silva and his Everton side in Saturday's game, as the Hornets got the edge over the visitors with a 1-0 win.